He was trained by Horbowski in Warsaw. In 1908 he excited the first sensation when he sang in Warsaw Tenor-solo in Stabat Mater by G. Rossini. The same year he debuted at the opera house of Cracow as Turiddu in ‘’Cavalleria Rusticana’’. 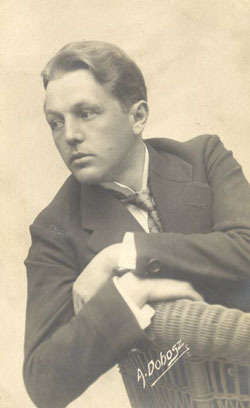 In the 1909-1914 seasons he was a member of the Lwów (Lvov) Opera. In 1914 he joined to the National Opera in Warsaw, where he had a huge success and appeared here till 1939. On 19. 6. 1926 he sang there in the premiere of the opera ‘’Krol Roger’’ by Karol Szymanowski as shepherd. In 1941-44 he was engaged by the Miasta-Theater in Warsaw. His repertoire included Belmonte in ‘’Entführung aus dem Serail’’, Almaviva in ‘’Barbiere di Siviglia’’, Duke in ‘’Rigoletto’’, José in ‘’Carmen’’, Canio in ‘’Pagliacci’’, Eleazar in ’’La Juive’’, Pinkerton in ‘’Madama Butterfly’’, Lenski in ’’Eugene Onegin’’ and De Grieux in ‘’Manon’’. He was active as professor of vocal in Warsaw. Married the operetta singer Walerie Markowska.